We previously reported on a consultation from the Department for Transport (DfT) in London which looked at centralising the delivery of vehicle and registration services at the Driver Vehicle Licensing Agency (DVLA) in Swansea, the consultation ran until the 11th September 2013. The Department of the Environment (DOE) in Northern Ireland though its previous Minister, Alex Atwood and now its current Minister Mark Durkin defended a position to keep the delivery of vehicle and registration services here in Northern Ireland. 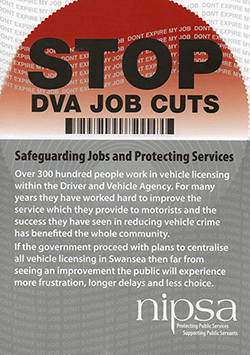 The opposition and concern of centralising these services in Swansea was that this move could result in the loss of some 300 jobs in Northern Ireland, (DVLA are closing 39 local offices in GB), Environment Minister Mark H Durkan has expressed his opposition and concern. The DOE Minister Mark H Durkan and DOE officials met last week the Transport Minister, Robert Goodwill, in London, to discuss the proposed DVLA centralisation of DVA jobs to Swansea. NIPSA – Northern Ireland Public Service Alliance (NIPSA) – who represent over 45,000 members from across the civil and public services and the voluntary sector, including the DVA staff in Northern Ireland, report on their meeting with the Transport Minister, Robert Goodwill MP, in London. At the beginning of the meeting NIPSA showed the Transport Minister a short film (see below), which highlights the concerns of local business representatives and the community in the Causeway coast area at the potential loss of these public sector jobs. The NIPSA delegation, which included local MPs, Gregory Campbell and Ian Paisley Jnr. was informed that the Minister would be unlikely to make an announcement until late December or early in the New Year. Following the meeting a petition was officially presented to the Minister on the steps of the Department for Transport. NIPSA also report that they were able to take the opportunity to meet with the Northern Ireland Affairs Select Committee. They were able to give a presentation to several Conservative and Labour MPs and while in the House of Commons and Portcullis House they were also able to lobby several other MPs, including the former and current Shadow Secretaries of State for Northern Ireland. As we have previously said, “We are aware that the DVLA has previously mishandled renewals and other documentation e.g. 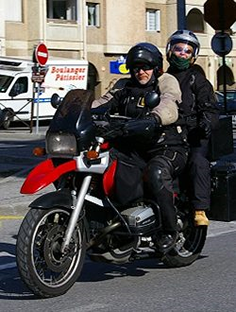 removing motorcycling licence categories from licences, giving riders no possiblility of recompense to get their licence back other than resitting a full test, even with evidence that a rider had held a licence for many decades. While part of the DfT reasoning behind these moves is, “The delivery of secure online and telephone services to improve customers experiences” , “our” system allows for 8,000 people to relicence their vehicles on Christmas Day last year. The ultimate importance of the whole affair is the keeping of 300 jobs here in Northern Ireland, therefore we stand with the Minister Mark Durkin and NIPSA. Minister Durkan said: “At the meeting today I reiterated that there is no reason for vehicle licensing offices in Coleraine and across Northern Ireland to close and that this excellent service should be enhanced through greater investment by DVLA. “I got a good hearing from Robert Goodwill and he acknowledged the strong, definitive economic, social and political arguments for retaining these jobs and service. “It was clear from the discussion that given the strength of the arguments in favour of Northern Ireland, there is political interest at the highest level of the British government in this decision. I remain hopeful that the right decision will be made for motorists in NI and for staff. Minister Goodwill indicated that any decision would be unlikely to be made until the New Year. Yesterday a delegation of NIPSA representatives and DVA staff met with Transport Minister, Robert Goodwill MP, in London to urge him to retain vehicle licensing services and local offices in Northern Ireland. A number of DVLA officials were present and our delegation included local MPs, Gregory Campbell and Ian Paisley Jnr. We took the opportunity at the beginning of the meeting to show the Minister a short film, commissioned by NIPSA, which highlights the concerns of local business representatives and the community in the Causeway coast area at the potential loss of these public sector jobs. The film is now available to view and members are encouraged to share it widely. The Minister thanked us for going to the effort of producing the film and helping him to understand how much the DVA jobs matter to the local community. The meeting was useful and the delegation were given the time to highlight what we felt were important points around the impact of centralisation on the service, already increasing complaints through the Department of Transport’s Independent Complaints Assessor since DVLA offices closed, the predictable rise of vehicle crime and tax evasion, issues associated with the land border and other practical problems which do not arise in GB. We also pointed out how staff would be affected and in particular how transferring or relocating staff would not be a solution. The Minister listened and was engaged throughout and as the meeting concluded Mr Goodwill indicated that he had also been very strongly lobbied by a number of other MPs, the Secretary of State and the Prime Minister’s Office. The delegation was informed that the Minister would be unlikely to make an announcement until late December or early in the New Year. Following the meeting the petition was officially presented to the Minister on the steps of the Department for Transport. NIPSA also took the opportunity to meet with the Northern Ireland Affairs Select Committee yesterday morning. Although the meeting was arranged at short notice we were able to give a presentation to several Conservative and Labour MPs all of whom were supportive of the campaign. The Committee updated us regarding the previous day’s Committee meeting when they raised the matter with the Secretary of State for Northern Ireland. The delegation pointed out that representatives from the local councils and Chamber of Commerce were keen to meet with them and it is expected that we will have further engagement with the Select Committee. While in the House of Commons and Portcullis House we were also able to lobby several other MPs, and the former and current Shadow Secretaries of State for Northern Ireland. This proved particularly useful as the recently appointed Shadow Secretary of State, Ivan Lewis MP, agreed that he would seek to include County Hall in his itinerary when he visits Belfast and the North West next month. I would like to point out that the petition has been very useful in getting across to MPs just how much support there is from the local community. The continuation of the petition is a great way of keeping the media interested and ensuring that the campaign continues to engage with MPs who are based in Westminster and in a position to use their influence with the Minister and his Government colleagues. We are therefore asking that members make every effort to increase the number of signatures so that we can officially present an even larger number of signatures to No.10 Downing Street in December. We have only a few weeks left to ensure that we can maximise all the support we have both in Northern Ireland and in Westminster to ensure that the proposals to centralise all vehicle licensing functions in Swansea are scrapped. Thank you in advance for all your continuing efforts.